Challenge 19 - Longtown 10 - April 2013. Yesterday, Saturday 6th April 2013 I ran in a brand new event for 2013, a stunning 10 mile road race starting and finishing in the small border town of Longtown, which is 8 miles East of Carlisle and on the Scottish border! As well as this being Longtown's first race this was also my first race of 2013 and the first since my injury! The race had a 12 O'clock start, with race registration between 10.30am and 11.30am and the race safety briefing scheduled for 11.35am. Although it was a lovely sunny morning it was still very chilly therefore I had the usual debate on suitable clothing! I opted for a T.Shirt with long leggings and hoped for the best! I thought a 12 midday start an unusual race time and found it quite difficult to plan when and what to eat. I ended up having toast and jam when I got up at 8am, then I had porridge at 9.30am just prior to leaving home at 9.45am. I felt very apprehensive on the 55 mile drive up from where we live in Kendal and whereas I usually worry about disappointing myself and not achieving a PB, today I was worried about not actually finishing the race! I didn't feel fit enough or at all race ready but I was determined to race and not get another DNS! I had even convinced myself that a DLF was better than another DNS, but I don't think I could cope with a DNF! This isn't even a race I had planned to do. 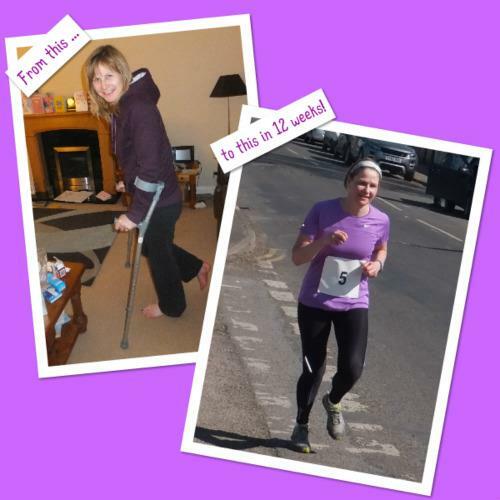 Originally I had entered the Carlisle 10K which was on the 20th January 2013 but I had to cancel my place in that due to my injury. Sport in Action (the race organisers) very kindly offered to transfer my entry fee from that race to the Longtown 10. Unfortunately it was 10 Miles not K! After an uneventful car journey we arrived at Longtown Primary School, which was where the Race Head Quarters were situated at around 11am. I collected my race number (number 5 - I have never had a single figure race number before!) along with safety pins and attached it to my T Shirt before I headed to the toilets. Luckily as we were early there was no queue at this point, but there was only one unisex toilet! I then settled down in the school hall and watched all the other runners arrive. I always play a little game with myself at these events to while away the time - who will be fast and who will be slow! You really can't tell and 9 times out of 10 I get a surprise! However, most of the athletes arriving all gave off the aura of being bloody fast and this did nothing to steady my nerves! Just before the 11.35am race briefing I decided I needed another nervous wee, along with the majority of the others runners - that with the combination of only one toilet was not a good scenario. Waiting for the safety briefing to start! Too chilly to remove my top just yet! Consequently this delayed the briefing which eventually took part at around 11.50am. Although I have often read in road race rules that ipods are not permitted this is the first race I have been in where they actually enforced this ruling and made people remove the offending item! The race director then went on to explain that the start line was a few minutes walk away and we would all go as a group. He also explained that the race had an easy route to follow with only three turns and a Marshall would be situated at each directing the way, he said if you don't see a Marshall don't turn off, keep on going! (I thought even I can do that!) THEN he went on to give his little bit of advice on how to run this race to achieve a PB. My advice to him would be to keep his gob shut in future! He reckoned the best race strategy was to treat it as a 10K race and run at 10K pace because the last 4 miles were all downhill so plenty opportunity to recover with easy running back to the finish! EErrrrrrrrrr NO!! I beg to differ! I would describe the course as mainly "undulating" with a couple of bigger hills thrown in for good measure! After firing everyone up with the idea this was the fastest 10 miler ever we headed to the start line. As we headed off in our pack I had two little voices in my head, my sports physio saying "Think of your ankle, be sensible, don't race it, just enjoy it" and this bloke saying "Run like hell!" We got to the starting area where the organiser produced a white spray paint can and sprayed the start line there and then! No one seemed to bother that we were casually walking and lining up in a road that wasn't closed to traffic - except the car drivers themselves. I saw a few irate looking faces as they tried to negotiate there way past us without taking anyone out! I AM hidden amongst these speedy looking people honest! I mingled in the middle of the pack, which was a very small field of approximately 100 runners, and before I knew it we were OFF! The front runners had obviously taken his wise words to heart as they left like a rat out of a trap and I did start to wonder what I had let myself in for. Determined to run my own race and not be influenced by those around me I tried to remain at a pace I was happy with, and my ankle could cope with. Before I knew it the race had spaced out, and although I could see runners in the distance and see some behind me (when I dared to peek over my shoulder) I felt very much on my own. The roads were all open to traffic but I think I could count on one hand the number of vehicles I saw on the entire 10 mile route and that included a couple of tractors! However, on the downside I think I could also count on one hand the number of spectators I saw on the entire 10 mile route too! However, this race will probably win the most scenic I have experienced, and with the sun shining down on us the views were fabulous! It was a very warm day and after climbing some hills I was ready for a drink fairly early on but knew the drinks station was situated at mile 5 (I wish I had carried my own by this point!). When the drinks station eventually came into sight it was at the top of a fairly steep hill! I motored on up with the incentive of getting some thirst relief at the top. Oh I was so disappointed when I was handed a miserly quantity of water (very cold may I add) in a plastic cup! I had my sights set on a water bottle I could take with me! With the water down me, literally rather than down my throat, I was off again and straight up another hill! By this point I had lost sight of all the runners in front of me but could still see some behind so knew I wasn't last! At the top of this hill and at around mile 6 stood a cheery Marshall directing the way and with a smile said "All down hill from here!" as I turned the corner I was welcomed by a nice downhill section. I smiled to myself and thought "all easy from now on" no sooner had this thought appeared in my head a hill appeared infront of my eyes - going upwards!!! The 4 mile downhill section promised to us (in my humble opinion) is in the race organisers imaginations! view and even more pleased to see the finish line. As I crossed the finish line I was handed a small bottle of water but there was nothing else! No spectators clapping, no "finished" runners encouraging others on, no banana, no goody bag, no T shirt, no mug and worst of all NO BLING!!!! However, saying all that I maybe missed something or the front runners had scoffed it all before I got there because I noticed someone had commented on the race website "It was nice to get food at the finish!" This wasn't a chipped event but I had finished in 1:33:54 according to my Garmin but I had nothing to prove I had been there! You can view my run here. I am still waiting for the official gun times! So in a nutshell, a fabulous scenic course which I enjoyed as my return to racing. I'm not convinced whether my current low level of fitness or the course made it feel such hard work but lack of cheering spectators, atmosphere and drink certainly didn't help! As it was such a nice day I had made the right choice with wearing a T Shirt but really needed three quarter leggings too instead of my winter ones! However, after saying all that if they run it again next year I Will - after all I have a course PB to achieve now and hopefully I won't be a recovering runner then either! Looking at the photographs from today I can't believe how different (read fat!) I look compared with when I am fit! Need to do something about that! UPDATE: The Official results have just come in. Mine was 1:33:57 only 3 seconds different to my Garmin! The results can be viewed here! I was 82nd out of 91 but 6th in my catergory! The official Photographs from the day can be viewed here although I am only on one of them!